The Lusenti Winery is in Vicobarone, near Ziano Piacentino in the Val Tidone. The history of the winery began the early nineteen hundreds when Pietro bought the first farm for growing table grapes. In the 1960's his son, Gaetano, bought other land and planted vineyards that still produce excellent wine grapes today. Lodovica, the youngest of three sisters decided to dedicate herself to looking after the vineyards. It wasn’t an immediate decision but contact with nature, which speaks to you if you learn how to respect it and which teaches you the rhythm of life in the alternating of the seasons and the many friends that share the same passions helped to make the decision. Today the winery is ideally a junction between past and present, between the wines that make up tradition and the wines created from decisions made in the early 1990s. 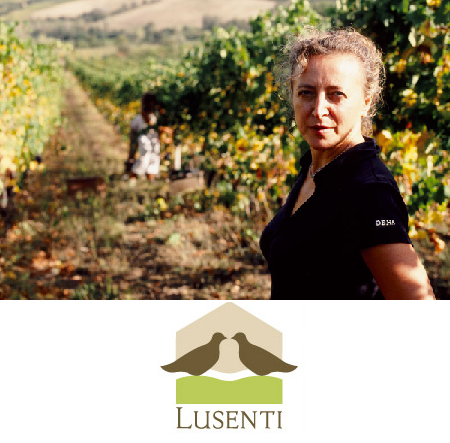 Lusenti produces only wines from local grape varieties: Bonarda, Malvasia di Candia aromatica and Ortrugo. It is the wealth of flavors and experience that the consumer has the chance to take away with them. In the cellar Lodovica tries to enhance every single grape variety as much as possible, but above all trying never to alter what the vineyard gives, already healthy and ripe. Therefore the processes for each style of wine are very different, respecting the characteristics of the variety and the vintage at the same time. In the cellar as in the vineyard, man intervenes as little as possible on the grapes, without speeding up the natural processes of transforming grapes into wine. The grapes for making sparkling wines usually come from quite young vineyards, starting from the sixth-seventh year of production, when the yield per hectare is around 9-10 tons. For wines made from non-aromatic white varieties, there is no maceration on skins, just gentle crushing and then the free-run juice is drawn off and fermented under temperature control. Second fermentation takes place in pressure tanks with selected yeasts. There is absolutely no use of concentrated must, only the naturally sweet free-run juice preserved at low temperatures. Fermentation (both alcoholic and malolactic) of must for making sparkling reds, wines with considerable structure for this kind of style, is done in vats. After cold tartaric stabilization, which occurs naturally during winter, the wines undergo second fermentation in pressure tanks with the addition of free run juice from the same grapes. Wines are not micro-filtered and are bottled in the cellar. After bottling, there is further maturation in bottle which lasts for a few months.